The Skinny: The first film from director Charlie Young is a solid courtroom drama that spins way out of control thanks to unbelievable plot twists and questionable political correctness. Well-meaning but a disappointment. by Kozo: Charlie Young adds new line items to her resume with her debut directorial work Christmas Rose. Tsui Hark and Jacob Cheung co-produce this courtroom drama, based on a story by Young and a screenplay by Philip Lui (The Guillotines, Legend of the Fist), and the big names don’t end there. Young enlists Aaron Kwok, Guey Lun-Mei and Chang Chen for the lead roles, with many notable names (Liu Kai-Chi, Qin Hailu, Pat Ha and even nineties actress Theresa Lee) shoring up the supporting cast. Unfortunately the resulting film doesn’t match its promising pedigree; while a passable drama for some of its running time, Christmas Rose ultimately capsizes beneath unbelievable plot twists, misguided direction, one-note characters and an overdone music score. The positives: it’s competently-made, well-produced and clocks in at only 89 minutes, so it won’t eat up much of your precious moviegoing time. Choose your half of the glass. 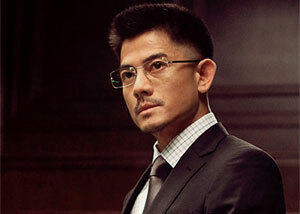 Aaron Kwok stars as Tim Chen, a defense attorney in a high-powered firm who decides to chuck it all and become a court-appointed prosecutor because he really wants to punish bad guys. 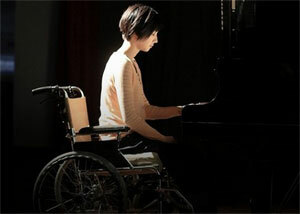 Immediately, Tim gets a slam dunk case: Disabled piano teacher Jane Li (Guey Lun-Mei) has accused celebrity doctor Winston Zhou (Chang Chen) of sexual assault, and who wouldn’t believe the sweet and angelic Jane over the professional and seemingly cold Dr. Zhou? The press amps up the outrage, and though Tim’s role as an assigned prosecutor means he must remain distant from Jane, he’s definitely on her side. While Tim prepares for a knockout courtroom battle with cocksure defense lawyer Freddy Xue (Xia Yu), Tim’s colleague Yan (Liu Kai-Chi) begins to suspect there may be more to Dr. Zhou and Jane’s relationship than meets the eye. Will justice be served or will the bad guys get off? And are the bad guys really bad guys? Christmas Rose is loaded with intriguing and complex situations. There were no witnesses to Dr. Zhou’s alleged crime besides Jane, so the whole thing is a “she said, he said” with the caveat that Jane is a disabled girl which automatically gets her sympathy. On the other hand, Dr. Zhou is an upstanding if standoffish individual with no prior issues, while Jane has a habit of showing affection towards protective males, among them Tim himself, who she presents with origami roses not unlike the ones she gifted to Dr. Zhou. Characters have to weigh these issues when making their decisions, and the film isn’t initially clear on what actually happened, with minor Rashomon-like sequences offering two possible “truths”. Charlie Young stages her courtroom scenes in a disorganized manner and employs too much slow motion, but she sets up the central drama solidly enough. Given the evidence, this case could go either way. Then the wheels come off and Christmas Rose goes so far off the rails that a time machine would be required to undo its significant collateral damage. The filmmakers smartly concentrate on the courtroom case, as Tim Chen’s personal drama – he has unresolved issues with his father (Joe Cheung) – is uninspired and only tangentially related to the immediate story. However, the case veers towards a showy ending with surprise witnesses, questionably relevant tangents and abundant legal malpractice, not to mention plot twists that give easy outs to certain characters and are demeaning to people suffering mental ailments and past trauma. The script deals with tough subjects but it handles them in such a pious and patronizing manner that it becomes alarming. This is well-meaning but irresponsible screenwriting, and combined with the overdramatized style, overbearing music and the simple fact that the script engages in victim blaming…well, this is one disappointing Christmas.  Charlie Young and Christmas Rose won an Excellence Award from the Hong Kong Asia Film Financing Forum (HAF) in 2009 because she was able to raise the film’s entire US$2 million budget during the 3-day financing event. The award does not necessarily mean that Christmas Rose was recognized during its financing stage as a quality project.  Charlie Young’s pitch for Christmas Rose can be found here. The final film contains significant changes from the original pitch.